When our customers need a box construction or graphic treatment not included in our stock selection, we are able to fulfill highly speccialized requests in special priduction runs using up to six printed colors, and boards up to 36 pt. thick. Folding boxes will be designed, manufactured and printed according to your exact specifications! Determine the size box you need. First, you need to consider the size and construction of a suitable box for your product. Impress Packaging offers many standard sizes, shown in this catalog, that may help you plan-samples are readily available. Determine whether a standard size/style will work. If you find that none of the standard boxes will work for you, our Structural Design department can create exactly the size and style you need. Note that additional time is required for this service. You save money if you use similar-sized Impress Packaging standard styles and sizes, and pricing is available by phone. 5,000 per copy for both standard and non-standard constructions. 10% overrun/underrun applies. Cost savings are associated with standard construction. We can reproduce standard and special PMS colors suitable to your custom design. We use a standard aqueous gloss coating as a final finish to protect your printed graphic design. Many different coatings are available. You may submit camera-ready artwork or have the Graphic Services department produce custom art at a nominal charge. For boxes without imprinting, 4 weeks-from receipt of credit-approved order, if a proof is approved no less than 2 weeks before the promised shipping date. For boxes with imprinting or foil stamping, allow 6 weeks, with proof approval no less than 4 weeks before the promised shipping date. Any required proofs or plates will be billed at cost. Credit approval required before any preparatory work, including artwork, can be started. You must use a company purchase order or written confirmation on company letterhead, separate from the standard order form, when entering a custom packaging order. This procedure is also required when placing stock orders for quantities over 20,000 pieces. 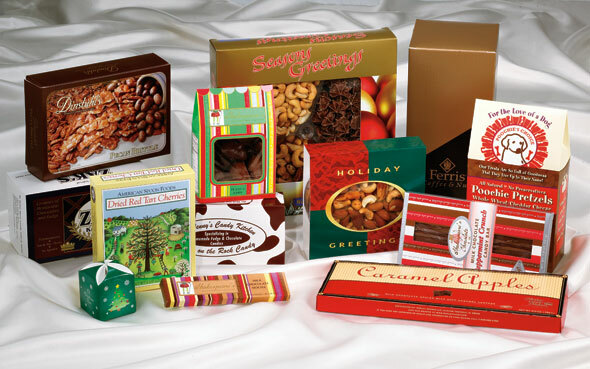 Custom packaging orders cannot be assorted with Impress Packaging stock items for quantity pricing.